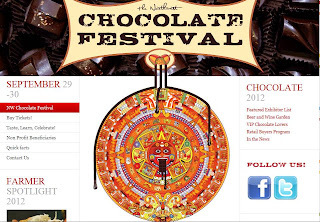 I'm so excited about the NW Chocolate Festival this year! With only five days to go I will be focusing on how to prepare for the festival every day this week. Prefer to watch video? The video version is at the bottom of this post, page down and watch. Bill Fredericks opening a fresh cacao pod. Yes, you will be able to taste fresh cacao! Step one: Check the events and education schedule. Education is what sets this festival apart from so many others. Instead of just gorging yourself on chocolate you will have the chance to hear presentations and workshops (many with chocolate tastings) from the top chocolate professionals from around the world, chocolate makers, chocolatiers, see celebrity chefs in action on the culinary stage, and watch some of Seattle's top bartenders in action. Chloe Doutre-Rousell from France, Mott Green from Grenada, Clay Gordon, and that is just the beginning of the list. Print the schedule for Saturday and Sunday. Highlight the presentations that are a must see for you. This will help you decide which day to go, or go both days (I'll be there both days). If you are looking to gorge yourself on fine chocolate there will be the opportunity to do that too. Later this week I'll talk more about a plan with purpose for all of the chocolate tasting that you will be doing at the festival. Dandelion Chocolate will be back again this year with a new Madagascar Bar! Step two: Make sure you have tickets. Available online at www.nwchocolate.com or locally at Chocolopolis or Chocolate Man. If you buy in person at one of the local shops you will save yourself processing fees however you will have to go in person and pay in cash. It is a good idea to call ahead to make sure that the retailer still has a supply of tickets too. More to come this week about the festival. Keep sending your questions my way!